The salary for Vocational Nurse in the United States is $44,090 per annum, which is $2,240 higher than the U.S. national income. LVN average salary is $3,962 per month, $914 per week and $22.86 per hour. The salary of LVN will change depending on many factors, including skill sets, experiences, education and location (for example in hospitals, at homes or some individual institutions), etc. How much do LVNs make? 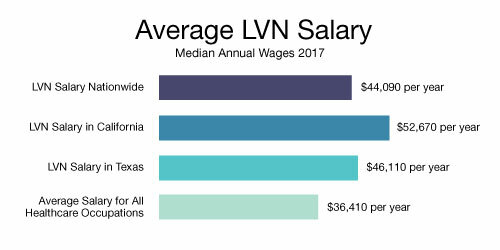 The charts below will break down the average LVN salary even further by delving into how the specific FIELD of vocational nursing can affect pay. In many states, correctional nurses make substantially more than LVNs in other fields. A research nurse LVN is one of the highest paying jobs in the country, with the average income sitting at $58,500 per year. By working at college or for an insurance company, a nurse can make at least $54,000 a year. “The City by the Bay” is the highest paying metro area for a nurse in California. Southeast Alaska and St. Mary’s County, Maryland, are two of the best non-metro areas based on annual salaries. The salary of licensed vocational nurses with no previous work experience is usually lower than the median pay. However, there are is a way in which you can increase your LVN salary straight out of school. Learn more about this method and how to use it effectively. Specialization will giver you a higher salary right after graduating from school. It is true that LVNs are mostly generalists and do not specialize in a certain field of medicine. However, as a licensed vocational nurse, you can specialize in the performance of certain duties. Many health care facilities now are looking for LVNs with such specializations and offer higher remuneration for their services. What areas can you specialize in to increase your LVN starting salary? You can choose to specialize in IV (intravenous) therapy. You will gain more extensive knowledge and skills in administering intravenous medications to patients. This kind of specialization can give you a head career start in any general hospital or hospice. Gerontology is another specialization area that is growing in popularity among licensed vocational nurses. You will learn how to work with elderly patients. You will learn about the changes in their physiology and how you can assist them to feel and live better, especially when they have chronic medical conditions. Specialization in gerontology will almost certainly guarantees you a higher LVN starting salary, as the demand for licensed vocational nurses in nursing care facilities for the elderly is extremely high. In addition, remuneration at such facilities tends to be higher in general. Long-term care is another favorable type of specialization. You will learn how to provide constant care for permanently ill and/or disabled people. Such a specialization can open many opportunities to you in the home health care services industry. LVNs providing such services have similar pay to those working in nursing care facilities. How can you get specialization to increase your LVN salary? You simply have to find a specialization course. These are readily available from various community and private colleges, technical schools and professional associations. The only prerequisite for singing up is to be a licensed vocational nurse. You can readily start such a course right after completing your program in vocational nursing. Most courses last less than two months and have options for online learning. The fees vary, but you may get to study for free, if you get a course through a professional association that you are a member of. This is how to increase your LVN starting salary straight out of nursing school. All hospitals need an army of professional healthcare providers. This includes both vocational and registered nurses. Along with the nursing staff, the hospital also needs to employ the best doctors and other medical staff to run an efficient and reputable hospital. To run the operations of the hospital it also needs to employ an administrative, legal and custodial staff that will help them run the hospital in an organized way. As most physicians will tell you, nurses are the ones that help run the hospital as they are simply indispensable in taking care of the sick people and also carrying out specific medical procedures. The income or the LVN salary they get from the jobs is a main driving force that attracts people to the nursing profession. Your LVN salary depends on your qualifications and your vocational work experience, as the more knowledgeable and caring you are the more chances are that you become virtually indispensable and can get an increased LVN salary. You can get excellent opportunities to stay connected with the right nursing jobs that get you the highest LVN salary. This is mainly because of the passion and dedication you’ll put forth in your nursing skills. Keep Up Your Nursing Skills! Keeping up with the fast moving innovative age that we are currently in can put you light years ahead of your competition. To stay ahead you need to speed up your nursing education and skills and enroll in additional nursing courses so that you can match the pace of the advancements in your nursing career which will increase your chance of getting good job options and get excellent LVN salary after your LVN training is complete. You can also search on the internet and go through the available nursing options and can get through to nursing jobs that pay a higher than average salary. Another great option is enrolling in a nursing placement agencies. These agencies will keep a large database of available positions and place you based on your qualifications. An nursing job agency will proof invaluable to your nursing career and through these placements you will gain further experience that can increase your LVN salary further. By staying connected and networking with other medical professionals and making a professional profile on a career site this can allow you to make way for excellent nursing jobs that pay a good LVN Salary as people can make contact with you through the network and make your job hunt in finding jobs with the highest salaries much easier. In recent years the demand for nurses in Texas has increased dramatically. As the demand increases, so does the pay for most licensed vocational nurses. 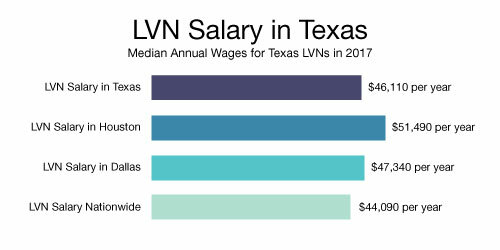 LVNs in all the major cities in Texas(Dallas, Houston, Austin) have seen their average hourly pay increase faster than the national average. LVN’s in Texas work with registered nurses, doctors, and other allied healthcare professionals to help give people of all ages quality medical care. The mean yearly wage for LVNs in Texas was $44,840 in 2016. 2017 is already showing higher gains than this! Many factors can increase these numbers. Some of the factors include how many years on the job, geographic locations, employer size, and the industry you happen to be working in. Hourly wages vary widely from city to city, with the median hourly rate the first year averaging $21.56, according to the Bureau of Labor Statistics. After 10 years of service you can be making as much as 29.85 an hour. Many people wonder why vocational nursing pay is higher in Texas than in other parts of the country. Many times LVNs will take the lead when the doctor is not there, as their scope of practice allows them to perform many of the same duties as registered nurses. Some of these duties can include monitoring patient’s progress, collect samples for test to reactions to medicines, and starting IVs. LVNs are a vital part of a hospital staff and this is one reason they get paid very well. Houston-The Woodlands-Sugar Land Has Seen a Population Explosion! In most parts of Texas, LVNs have more opportunities then ever before because of the shortage of nurses. One of the fastest growing places where LVNs are in demand is home health care services. Skilled nursing facilities are also seeing a surge in demand for trained vocational nurses. The salary for a home health care LVN will start in the mid $40,000 range and can go to the low $60,000 range. Just like other health care jobs, a lot of things will affect these figures. Major cities in Texas will usually pay more then smaller cities where the demand may not be so high. An example of this can be seen in the pay for vocational nurses in the Houston-Sugar Land metropolitan area. The population of this area has skyrocketed to 6.6 million people! Another big factor for LVN salary is the education level that you have. The more valuable you can be to an employer the higher your salary can go. As 2017 comes to an end, employment for LVNs in Texas is expected to grow a lot faster than the average in home health care services. This means that the LVN salary will also increase as the shortages for nurses continue to grow. Currently over 702,000 LVN jobs were held in hospitals and nursing care facilities. Between now and 2026 the number should still increase as the elderly population continues to age and experience health issues. Physician offices and outpatient care centers are going to be where some of the increases will be needed. The average LVN salary in Texas should continue to rise and this is the perfect time to become one. If you like helping people and want to get paid well for it then becoming a Licensed vocational Nurse is something you should consider. With the LVN salary rising it just makes perfect sense in today’s world. California is the most populous state in the US, so you may expect vocational nurses to make more here than in any other state. Unfortunately, that isn’t the case. There are 5 states where LVNs make more than in California. Regardless of that, pay for LVNs in California is higher than the majority of the country. In 2016, the last year the Bureau of Labor Statistics did a salary survey, California LVNs earned a median average salary of $52,670 per year. That works out to $25.32 per hour. Of course some LVNs make less than that, while many made significantly more. There are many factors that affect how much you’ll make as an LVN in the Golden State. We’ll cover some of those factors below. It isn’t a surprise to most that vocational nurses in the Bay Area earn the most. One of the main reasons, of course, is the incredibly high cost of living. But there are other reasons, too: San Francisco has more hospitals per capita than most large cities. This alone increases the need for LVNs. There are also more skilled nursing facilities in the Bay Area than most cities in California. Kaiser Permanente has a major presence here, and they are known for their aggressive recruitment of licensed vocational nurses. Many people don’t know that LVNs can be Charge Nurses. Yes, they can! Most of these Charge Nurse positions are in skilled nursing facilities or other types of extended care settings. Most of these positions are filled by women, and it is a demanding job. Not only will you be responsible for the staff nurses under you, you’ll also be responsible for CNAs. The Charge Nurse LVN has to ensure all patients receive their medications on time, make sure the patients have no bed sores, and be able to communicate effectively with the physician, should she/he call in orders or make changes to the patient’s care plan. In California, LVNs who accept these positions often make more than $30.00 per hour, which is commessurate with the high level of responsibility. Every state has different rules for what vocational nurses can and can’t do. In California, LVNs ARE permitted to become certified in Advanced Cardiac Life Support(ACLS) and IV therapy. Having these certifications will typically put upward pressure on how much a nurse makes. Experience will also affect your pay. Obviously, the more years of work under your belt, the higher your pay will typically be. 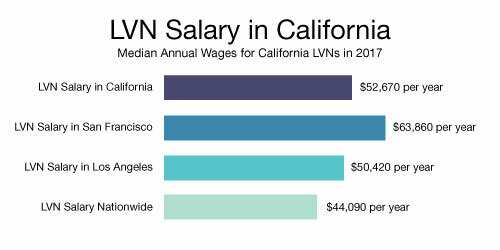 The average LVN salary in California for employees with over 10 years of experience is close to $32.00 per hour. This is nearly $10.00 more than the national average! Many new vocational nurses have just recently graduated from one of the 160+ accredited LVN programs, and are content spending their entire careers as LVNs. Others will continue their education by completing either one of the LVN to RN programs or LVN to BSN programs. Completing one of these “Bridge” programs is a major challenge, but will pay HUGE dividends. First of all, there are many of these “Bridge” programs in California, so you don’t have to look far for an accredited program. Many community colleges and some private colleges offer them. Secondly, the pay for registered nurses, whether Associate or Bachelors prepared, is significantly higher than the pay for LVNs in California. To the uninitiated, nursing seems to be a pretty general category of employment with similar educational requirements for all who participate. But nothing could be further from the truth. There are literally dozens of types of nursing programs one could enter depending on the career he or she is after. Before a nursing student even enters school it’s a good idea for the individual to speak with counselors in order to set some educational and career objectives. That makes choosing the right program a little bit easier. We have included below most of the major nursing programs currently available. Please keep in mind that both the list and the accompanying descriptions are general in nature. There is no way to provide a fully comprehensive list because there are so many different schools offering different types of programs. This list is intended to be a guide to help you get a better handle on the direction you want to go in. The first and most basic level of nursing is that of the licensed practical nurse (LPN); in some states this level is also known as the licensed vocational nurse (LVN). To start in this entry-level position typically only requires a one-year program and the passing of a licensing exam. The licensing exam is a combination of the nationally recognized NCLEX-PN examination and any other testing requirements that may be required by your state. It’s important to note that licenses are generally only recognized in the state where they are earned. LVN’s interested in taking the NCLEX exam later on will need to enroll in an associate degree program for further education. Such a program enhances the practical skills the LVN has already gained through a one-year certification program and/or on-the-job experience. While the program and its subsequent exam won’t necessarily increase earning power or advancement potential, it does provide official credits for basic nursing skills that could be used later on in continuing education. The average LVN salary for these nurses is now over $50,000! The ADN degree is perhaps the most popular program for students who wish to become an entry-level registered nurse. It is a two-year course which focuses heavily on the practical, day-to-day tasks of nursing in a hospital or clinical environment. The advantage of seeking this degree is that it allows individuals to begin working as a registered nurse after only two years, as opposed to a four year bachelor degree program. When you consider the salary difference between the registered nurse and the LVN, this can be quite attractive. Many vocational nurses take one of the many LVN to RN programs to further their education. Like the ADN degree, the BSN program is extremely popular because so many hospitals and clinics require this degree as a prerequisite for even entry-level positions. In addition, the BSN is more and more being considered the bare minimum for registered nursing. As the thinking goes, as long as nurses are going to be paid as well as they are, employers are going to require them to have significant education and experience. Most BSN programs are a minimum four years, split between liberal arts and nursing-specific courses. The bachelor program for LVNs is designed to allow nurses to complete their four year program while working as LVNs. The difference between this program and a standard bachelor degree program is that it can be completed within four semesters as opposed to four calendar years. The program takes advantage of the fact that the LVN already has a certain amount of education as well as significant practical experience through working. These types of programs are quickly gaining popularity due to changes in the nursing vocation as a whole. As previously mentioned, it’s not uncommon for registered nurses to begin working as soon as they complete an associate degree and pass the licensing exam. However, many of them choose this path as a means of getting into the workforce while they pursue the requirements of a bachelor degree. This program can typically be completed in two years or less because it gives credit for the practical experience already gained as a working registered nurse. As an interesting side note, nearly 1/3 of all registered nurses with a bachelor degree earn it through such a program. For nursing students who have already completed two years of liberal arts education in a non-nursing program, the availability of theses secondary / accelerated nursing programs is a godsend. Because they’ve already completed their general education requirements prior to enrollment, programs like these will not require them to repeat those first two years. They will be given credit for their general education and put into an accelerated program that will allow them to earn their full BSN degree in no more than two years. Typically known simply as a master degree, the MSN degree requires an additional two years of education beyond the BSN. Therefore, completing the entire course from scratch would require a minimum of six years of education. There are some accelerated masters programs for individuals with BSN degrees and a certain number of years of experience. Those who earn master degrees are eligible to work as nurse practitioners or nurses in other high profile specialties. Some holders of master degrees forgo practical nursing altogether and enter hospital or business administration as an alternative. As we’ve seen with some of the other degree programs, registered nurses who wish to earn a masters can do so immediately after earning a bachelor degree under one of these programs. The MSN for registered nurses takes into account experience gained on the job plus the education previously received in the associate and bachelor programs. This is similar to the secondary/accelerated program for a BSN. It is designed for nursing candidates who have earned their lesser degrees in another field. Also known as “direct entry”, these programs give academic credit, where applicable, for the previously gained education. By being able to forgo repeating the liberal arts portion of the educational requirements, and being put into one of the fast track nursing programs, students who pursue a master’s degree through this type of program avoid most educational overlap. After earning either a BSN or MSN degree nurses can go on to earn specialty certificates in a specific area of interest. These certificates are evidence of special skills and knowledge required for a particular line of work. Typically they are earned through a brief educational course followed by an exam provided by the American Nurses Association. Certificates are a valuable tool for upward mobility and increased salary. Some certificates, like those necessary to work as a nurse practitioner or nurse midwife, are unavailable to those with just a bachelor degree. Such certificates require an MSN degree before they can be earned. A doctorate degree will most likely be necessary for nurses who wish to get into the fields of research or administration. They will require an additional 4 to 6 years beyond the master degree program, and will include areas of intense study specifically devoted to administration. Additionally, a doctorate degree in education allows the nurse to work in areas, such as education, that shape and define the nursing profession into the future. This particular program adds another 3 to 5 years beyond the master degree. There are several other doctorate programs which are brand-new to the field. Each of these programs requires a different time commitment from candidates and prepares them for different careers. Areas covered by these programs include research, scientific study, healthcare delivery methods, public policy, educational development, and healthcare-related economics. It must be noted that with most of the programs listed there is always the option of combining multiple programs simultaneously. The idea in doing so is to take advantage of time spent in education to gain as much training as possible in areas that might overlap. By combining degree programs students avoid repeating some of the same material as they move from one level to the next. Remember, as was stated at the beginning of this article, the list presented here does have quite a bit of variation depending on the chosen area of specialty and the schools a candidate is looking at. It is helpful to seek the advice of school counselors and nurses already in the profession to help you get an idea of your career goals. If you’ve already started your education and you’re unsure of your current track, don’t be afraid to ask questions. By gleaning from the experience of other nurses you’ll be better prepared to make sure you are making the best decisions possible.